The CH7231 supports the USB Type-C Electronically Marked Cable (E-Marker). 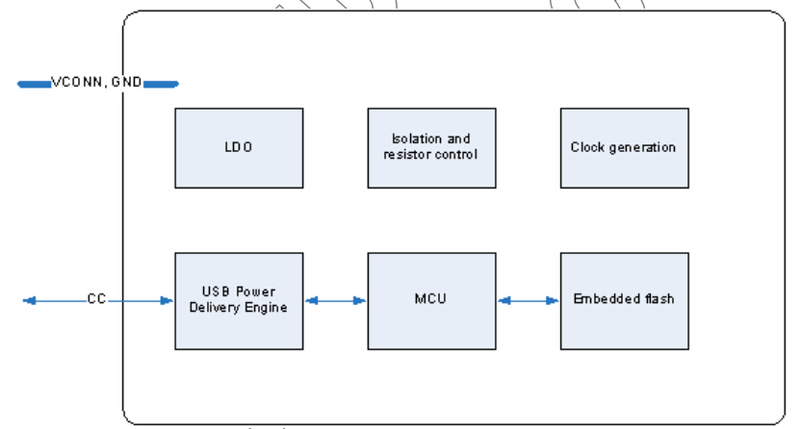 The device is designed to follow the USB Type-C Specification 1.1 and the USB Power Delivery Specification Revision 2.0, Version 1.1. The CH7231 is a low cost semiconductor device and can help the cable manufacturer easily enabling the USB Power Delivery feature required by USB Type-C E-Mark cable. In order to reduce the cost of the cable material, The CH7231 integrates all necessary components and circuits, such as LDO, clock generation, isolation circuit, Ra, etc. The on-chip embedded flash allows cable to store VDOs commands specified by the Power Delivery specification that to be used for communication between provider and consumer.